During Jan 22-25th 2019, Davos – Switzerland. An annual meeting for the World Economic Forum (WEF) took place at a local ski resort. It was seen that distributed ledger technology was undoubtedly the center of attention despite the lugging crypto bear market. Blockchain still ranks high for being one of the most disruptive technological innovations of the 21st century and was heavily discussed in Davos 2019. This sparked concern among the audience as Roubini went on, but the doubt was soon alleviated. Public figures from the crypto-space began opening discussions, from the influencers, to the blockchain enthusiasts. Sharing and exchanging views among another which switched the mood up. Not long before blockchain became a sensational topic of discussion throughout the events that took place during the consecutive days at the World Economic Forum. This event is considered to be one of the most renown summits in the world. This year it had attracted over 2,500 top business leaders, politicians, economists, celebrities, and journalists to attend the four-day summit to discuss the latest global innovations. To honor blockchain technology, the Blockchain Park Gala event held a conference covering the latest projects with technological developments in the blockchain ecosystem. Special awards were given, with the top being “Best ICO of Davos 2019”. Startups around got to pitch their projects to an audience, a panel of judges, and potential investors who were eyeing out for any of the latest cutting-edge innovative tech. Youtube celebrity IvanonTech and Ian Belina were also present alongside Anthony Khamsei, the CEO and founder of Resistance. The project that eventually won Best ICO of Davos 2019 during the pitching session. 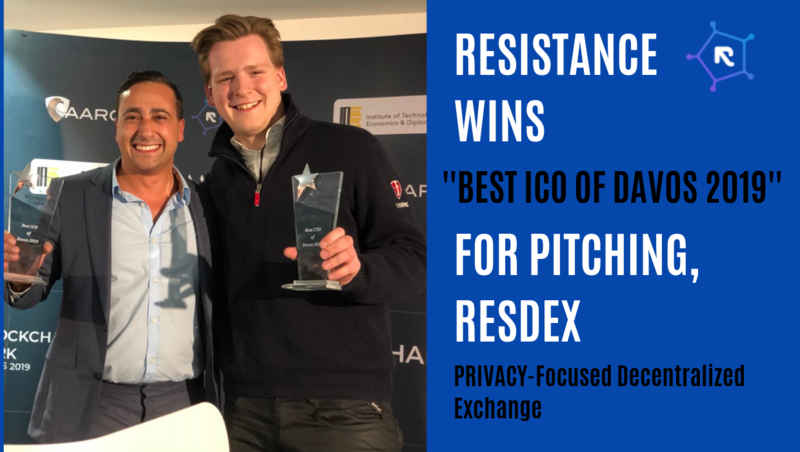 Resistance aims to be at the forefront of the industry by establishing a UI/UX friendly, privacy-driven Decentralized Exchange (DEX) that features a fiat gateway and an order-book supporting decentralized settlement. The privacy-oriented exchange, ResDEX, aims to facilitate private trading via optional TOR routing while featuring its own RES privacy token based off zk-Snark technology. This comes in addition with Atomic Swap functionality, allowing for decentralized settlement to occur cross-blockchain on the base layer (ie. ETH & BTC) via smart contract. Their network is maintained via laptop friendly mining and masternodes; paired with what’s coined ‘Proof of Research’ mining that utilizes your device’s resources to contribute to humanitarian studies such as computation for cancer research & other genomic studies. Furthermore, one of the most significant factors to a DEX’s success which many fail to achieve is liquidity. Resistance is tackling this through their strategic partnership with Huobi MENA, a branch of Huobi Group. The partnership will provide ResDEX, access to over 150 cryptocurrencies and 350 trading pairs, ensuring a counterparty is always available on their DEX. This comes complimentary with mentions of XRP’s liquidity provider to also assist in market making. It was a packed couple of days with amples of mingling. Several other projects also got to pitch their business ideas during the Blockchain Park Gala Dinner at Davos 2019, though the reality of things is that achieving certainty in any market is nearly impossible. But on the flip-side, the ever-changing world of crypto always creates unique challenges and opportunities to tackle. Now and then it comes to no surprise when well hear an influential spokesperson voice out both the merits and demerits of blockchain. Everyone’s got an opinion! Can't wait for ResDex to release! Hoping that liquidity does not become an issue. Due to their partnership with Huobi.